This item is Chloroprene Winter Jigging Glove Full Cover DG-7207W BLACK. Adopted soft and warm fabric on the shell side. Daiwa Angelrute Spinnrute - Prorex X Spin 2,40m 10-30g 2 Teile. Die DAIWA PROREX X SPIN Ruten liegen sehr angenehm und ausbalanciert in der Hand. DieDAIWA PROREX X SPIN Ruten liegen sehr angenehm und ausbalanciert in der Hand. This item is Chloroprene Winter Jigging Glove Full Cover DG-7207W BLUE. Adopted soft and warm fabric on the shell side. DAIWA glove M DG-7207W Blue chloroprene winter jigging full cover Japan new. If a conversion adapter can handle the electric power, all you need to do to use the product in your country is to change the plug to type A. The plug type in Japan is type A. Most of my products follow the Japanese electrical standard. Adopt super water repellent chloroprene to ensure heat retention. Size : M 23 - 24 cm, L 25 - 26 cm, XL 27 - 28 cm. This item is DAIWA Fishing Chloroprene Winter Jigging Glove 3 Cut DG-7107W BLACK. Adopt super water repellent chloroprene to ensure heat retention. Size : M 23 - 24 cm, L 25 - 26 cm, XL 27 - 28 cm. Maker : Daiwa. Model : Daiwa DG-2107. Product Highlight : Type : Gloves. We are not interested in going fishing with the bare essentials and hope to get lucky. Here at Shimreels, we are all nice people and we in turn hope that all the anglers out there are nice people as well. Adopt 0.7 mm ultra-thin chloroprene close to the bare skin sensation. 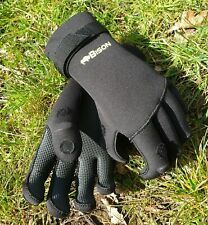 A long-awaited free cut glove appears! Because there is no sewing thread in the matching part of the fabric, it is hard to loose from the cut part. Daiwa Angelrute Spinnrute - Prorex X Spin 2,40m 15-50g 2 Teile. Die DAIWA PROREX X SPIN Ruten liegen sehr angenehm und ausbalanciert in der Hand. DieDAIWA PROREX X SPIN Ruten liegen sehr angenehm und ausbalanciert in der Hand. Daiwa DG-7907W Schwarzer Handschuh M Ultradünnes Chloropren Free Cut FREE Weltweit. Ein lang erwarteter Free Cut-Handschuh erscheint! Unten finden Sie eine automatische Übersetzung ins Deutsche. Farbe: Schwarz. Material: Chloroprene, Genuine Leather. 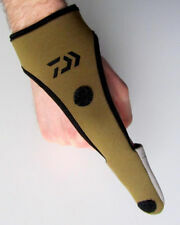 Type: Jigging Casting Glove. Style: Arctic. Approximate glove size estimate: 27~28cm. Product weight: 0.20kg. - from the end of April and the beggining of May (around Apr 27 to May 7). Maker : Daiwa. Model : Daiwa DG-2107. Product Highlight : Type : Gloves. We are not interested in going fishing with the bare essentials and hope to get lucky. Here at LureCandy, we are all nice people and we in turn hope that all the anglers out there are nice people as well.